I am an Evolutionary Ecologist and Associate Professor at Willamette University. 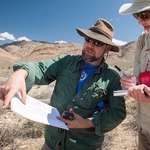 I am interested in coevolution and the biology of desert ecosystems. I am particularly interested in the conservation and ecology of the Joshua tree. By S. Earl Kang, Jr.
How can we create culturally competent workplaces for Muslim healthcare providers? Joshua Tree Genome Project Receives a Major Gift from The Living Desert Zoo and Gardens. Well, submitting our preproposal to Experiment is essentially we did. We just went to experiment first, and then went to NSF. Like Jeremy, I've been through this process multiple times before, both as a principal investigator (i.e., the person writing the grant) and as a panelist (i.e. the people reviewing grants). My feeling is that the pre proposals really are just a rate-limiting step on federal funding. They double the work that the investigator must do, and halve the number of full proposals that are considered. Now being at the full proposal stage, there is a kind of 'monty hall' effect where it seems like the odds of funding are dramatically improved (what if I told you that there was a donkey behind door number two? Now do you want to stick with door number one, or switch to door number three?). However, the reality is that the overall rate of funding is extremely low, and preproposals just slow down the rate at which funding requests can be considered. Thanks, Cindy. We've very happy about how it turned out. Well, James, we're all motivated by different things. ;-) Thanks for coming to the fundraising party tonight. We're very happy to have your support. We'll get there. Right now it's about building a reference genome. Then we'll start resequencing and quantifying genetic variation within and between Joshua trees. Thanks so much for your support and your kind words about the project! Please help us spread the word! Thank you to WU for this generous contribution and for helping bring this project to life!